Happy Friday! It's been a few months since I shared a few favorites with you following my friend Amy of MomAdvice's tradition of the 3 Little Things, but the kids are all at school and I've got a yummy maple spice latte in front of me. My writing project is calling my name, but sometime's a girl's gotta tap out a blog post, ya know? First up, I wanted to share a friendly PSA-- if you use Spotify (which, you should), and you haven't tried out the Discover Weekly feature, I can't recommend it enough. Go to "Browse" and under there, you will see a playlist that has a familiar face on the icon-- it will look like your own profile pic, to be specific-- that's called Discover Weekly. The beauty of this playlist is this: every Monday, a new playlist is created just for you, introducing you to new music that fits your tastes. My list this week has been particularly good. When I find great songs via Discover Weekly, I check out the artist and sometimes add their music to other playlists I have. It's a great way to find new music, that's spot on. I'm always worried that Gigi's and David's picks will mess up the algorithm for me but so far it has held true. ;) Super fun! And the latest related thing Spotify has cooked up is Discover Daily, which changes each day. I've yet to try that one. The other playlist I'm into right now is one I created on a whim right before I hosted a baby shower brunch for a friend. I simply threw on three albums that felt brunch-y: the new albums from Branches, All Sons & Daughters, and the Lumineers. It's a good mix that I keep going back to. Every few years, in fall or winter I get a hankering for bangs. I can't help myself; it's just a compulsion I seem to have! David doesn't particularly love this look for me but he understands my need for change every so often, so he gave me the thumbs up that I should go for it. I'm still training my new bangs to do what I want, and I still need to buy a round brush (I've got this one in my Amazon cart, on my hairstylist/friend Melissa's rec), but I'm pretty happy with them! It's good to have a friend who cuts hair, and also good to have a generous neighbor friend who has an extra flat-iron on her hands to give you (thanks, Jen!). While we're talking hair. I don't use a lot of products as I'm more of a coconut-oil-works-for-everything kind of gal, but I have really liked this Argan oil cream, Marrakesh Enz Lotion, for the dry ends and frizziness around the temples that I'm prone to. It's been a while since I requested to review a book from my friends over at Litfuse Publicity. I just have been overwhelmed with other good books (hence the giant library stack at home calling to me), but when I saw this book opportunity in my email, I knew it was for me. And it is. In fact, maybe it was written just for me... or perhaps, for you, too? If you've ever read my "about" page here on the blog, you have seen me use the phrase Renaissance soul. I am a woman of many passions, passions that include both raising and educating my children, and also following my own creative pursuits and dreams. 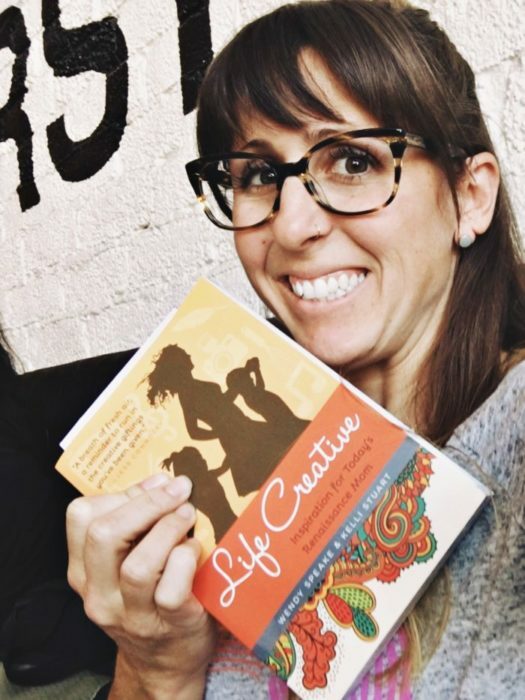 This book-- Life Creative: Inspiration for Today's Renaissance Mom, by Wendy Speake and Kelli Stuart-- is truly a gift to any moms who feel inclined toward any kind of creative pursuit, yet who are also raising children. It features stories from many creative moms-- moms that I either know and respect or follow on social media and admire from from afar-- and it is exactly what it sets out to be, "a love letter to your creative heart." The wonderful theme that underlies this book's purpose is the idea that through everything we do, the gospel is central. The authors affirm that our calling as mothers centers on this theme, and also encourages us that our creative passions are God-given, and can in fact bring him glory. "Rest fully in the knowledge that your creativity was not an accident, nor is your present circumstance of motherhood. They are both gifts from Him, both parts of a Master plan, woven and knit into beautiful you." If you are a mother and a creative-- in whatever form that takes-- this book will encourage you like a balm to the soul. Practically, it talks about things like why the world needs your art, how this Life Creative begins at home, when art can turn a profit, your part in this modern day Renaissance, but all with a message of heart and the gospel under it all. So those are a few things making me happy right now. Wishing you a great weekend, friends. Newsletter and reading update coming your way soon! This post contains Amazon affiliate links. Thanks to Litfuse for the review copy of Life Creative. Thanks for reading and for your support.